Two weeks ago I was in Luang Prabang, Laos–a truly magical city on a peninsula between two rivers, surrounded by incredibly picturesque mountains. Every day before dawn, saffron-robed monks walk the streets to collect alms–morsels of sticky rice that will be their only food for the day. Every evening the main road in the tourist part of town is suddenly transformed into a night market with dozens and dozens of collapsible red-canvas stalls erected by vendors selling locally produced crafts, including silk scarves, Hmong embroidered bags, t-shirts, jewelry, and small woven baskets for holding individual servings of rice. Walking through this crowded bazaar with so many dazzling colors and patterns can be overwhelming, particularly for someone who doesn’t savor the fine art of shopping. All during our trip through Thailand, Cambodia, and Laos, my wife was on a quest for silk, and some of the best items she found were in Luang Prabang. While she perused the stalls with an expert eye, I took in the spectacle with no intention of purchasing anything myself. I’m not much for souvenirs. But one night as we ran the silk gauntlet on our way to a restaurant highly recommended by Trip Advisor for it fine interpretations of traditional Loa cooking, I looked down and spotted something no one else in the market was selling–metal bottle openers in a variety of clever shapes. It was the electric guitar-shaped openers that first caught my eye. (I’m a sucker for anything guitar related, and my guitar-dar is finely tuned.) 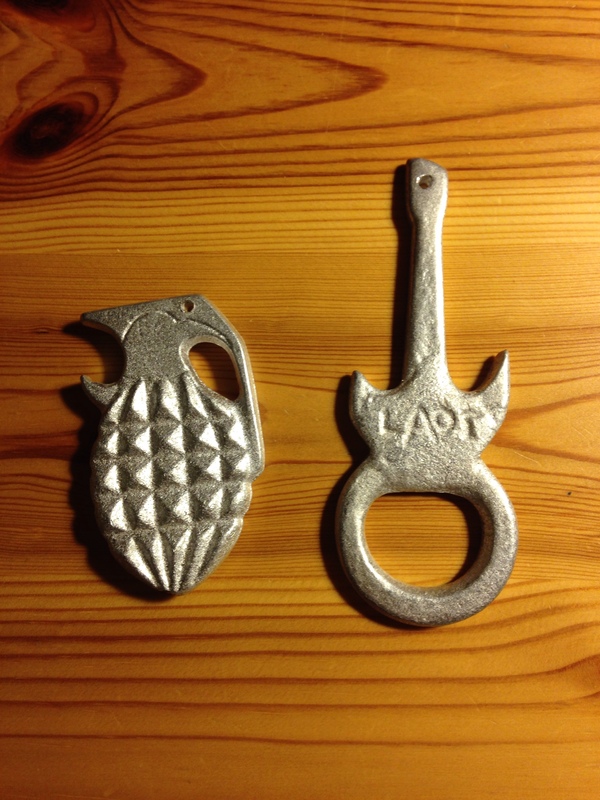 There were also tigers, elephants, monkeys, dogs, and rabbits, but when I saw the hand-grenade bottle opener, I knew I had to have one. And a guitar for my guitar buddy, Greg. They were easily packable and cheap–my kind of souvenir. But when I hunkered down to inspect them further, the woman selling them handed me a printed slip of paper that explained their origin. The metal used to make them, as well as the spoons and bracelets she was selling, was aluminum recovered from bombs that were dropped on the country during the Vietnam War. According to the peaceBomb Project, the organization that promotes theses crafts, between 1964 and 1973, the US dropped 250-260 million bombs on Laos to halt the spread of Communism. On the slip of paper, I read “1 B-52 plane loaded with bombs every 8 minutes 24 hours a day for 9 years.” According to Wikipedia, “Laos is the most heavily bombed country, per capita, in the world.” Unexploded cluster bombs from that era are still a big problem, killing and maiming dozens of people each year. Currently there are about 12,000 cluster bomb victims living in Laos. Scanning the breathtaking mountain scenery around me, I couldn’t help feeling that this was the equivalent of carpet-bombing Vermont. Holding these bottle openers, I was reminded of the bitter protests against the Vietnam War and how young men my age dreaded the prospects of being drafted. I suppose I could make a big point here about America’s tragic misadventure in Vietnam and the horrible “secret war” in Laos, but I won’t. I think the bigger point is the insanity of war in general and the fact that Laotians are still suffering 40 years later. But I’m heartened to see that a group of craftsman are making lemonade out of deadly lemons. Profits from these items go to microloans for artisans, electricity for rural schools, and organized efforts to locate and safely detonate bombs throughout the countryside. I gave the guitar opener to my friend, but I’ll be keeping the grenade for myself. It probably won’t get much use as a bottle opener, but it has nice heft in my hand and whenever I rediscover it in the kitchen drawer, I know I’ll stop and think about beautiful Luang Prabang and how these craftsmen are doing their version of beating swords into ploughshares. If you want to learn more about the peaceBomb Project, go to http://www.peace-bomb.com/peacebomb/ourmission.html.